Marissa Melton | VOA Sep 2, 2018. U.S. Navy Lt. Cmdr. 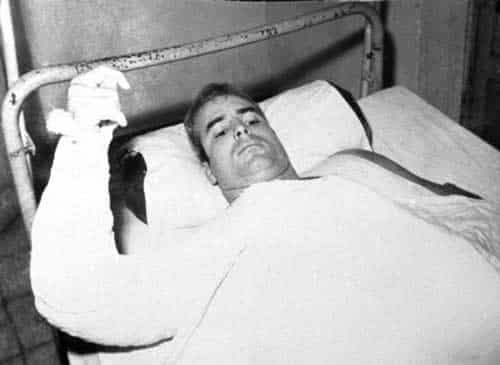 John S. McCain lies injured in North Vietnam wearing an arm cast, in this undated photo. Orson Swindle’s first conversation with the late Senator John McCain was tapped out in code on a wall between prison cells. The retired Marine officer met McCain in 1967 when both were prisoners of war at the infamous “Hanoi Hilton” prison in Vietnam. U.S. servicemen used a secret code to communicate with each other while confined to their cells. “The first thing he tapped to me was a joke that I can’t tell you,” Swindle said, because the joke was a bawdy one. The two men, imprisoned together until their release in early 1973, quickly formed a friendship that lasted until McCain’s death last week. McCain’s condition was dire when he was brought into what was formally known as Hòa Lò prison with two broken arms, a broken leg and other injuries sustained after his Skyhawk bomber jet was hit by a Vietnamese missile, October 26, 1967, forcing him to eject and parachute into Trúc Bach Lake. He was rescued from the lake and beaten by North Vietnamese fighters. During a phone conversation Friday, Swindle said he and McCain, later imprisoned in the same cell, talked constantly — partly to keep their minds sharp, partly to pass the time. Leon ‘Lee’ Ellis, a retired Air Force colonel, was also imprisoned with McCain. He was one of the youngest of the POWs and knew McCain first by reputation, as the son of the admiral in charge of U.S. Pacific forces. McCain’s refusal of a chance for release had made an impression on Ellis. Despite his status as an admiral’s son, despite his life-threatening injuries, McCain refused to leave prison until all of the men imprisoned ahead of him could be released as well. Swindle said humor was one of the tools the POWs deployed against the terror, uncertainty and monotony of life in enemy territory. “You could easily get down in the dumps,” he said. With some men enduring captivity as long as eight years by the end of the war, Swindle said, “we needed to pick each other up. “We had been through so much that was terrifying and painful,” he said. He noted that the torture to which POWs were subjected — “that’s the subject of a whole lot of other discussion” — largely stopped after the death of Vietnamese leader Ho Chi Minh in 1969. But with the easing of the struggle to survive came the challenge of staying optimistic in the face of monotonous uncertainty. McCain was often the ringleader of projects designed to lift the men’s spirits. Three months later when word of their impending release finally came, Ellis said the men were careful not to betray any joy or hopefulness to their captors. “We were determined, one, not to give them a photo op of cheering and going crazy, and two, we also had an attitude of we’ll wait and see. So when they read the protocol to us out in the camp yard there, we all just turned and walked away and walked back to our cells.” He said even the day his group left the camp, unbridled celebration didn’t break out until their plane was over international waters. Many of the POWs from that time are still in touch today, their struggle to survive the experience binding them together in a unique fraternity. McCain, Swindle, and Ellis have all been involved in POW reunions. McCain wrote the foreword to Ellis’s 2012 book on leadership. Ellis and Swindle supported McCain in the 2008 presidential election. The time in the POW camp shaped the rest of McCain’s life, Swindle said. By the end of McCain’s career, he had become an example of the rare lawmaker who would engage in across-the-aisle compromise. “He was courageous. He was a statesman, something we desperately need in our Congress,” Swindle said. “In fact, I would say that we need about 90 more senators like John McCain, and we’d be a hell of a lot better country.